In this article, we’ll offer some helpful tips about renting VW campervans in New England. Since our VW campervan business is based in Maine, we allow our camper vans to be driven in Maine, Vermont and New Hampshire. With permission, we’ll also allow travel to upstate New York. If you’re renting our 1973 Bay Window bus for a wedding, we will consider transporting that vehicle to Massachusetts and other nearby states if you inquire. Why Would I Rent a Vintage VW Westfalia for Camping or Touring in New England? First off, they’re amazingly cool. Strangers will wave, people will approach you at the gas station or at your campsite to ask about the vehicle. You’ll see the gleam of faded memories in the eyes of white-haired adults who attended their first concert or went on their first date in a VW hippie bus. Undoubtedly, people will want to share their stories with you. As you traverse the roads of New England, you’ll be thankful for the smaller footprint of the VW campervan when you make a 3-point turn, pull into a crowded parking lot, fill up with gas or pull into the relatively small pad at your campsite. In some parts of New England, not having a large vehicle is really helpful. We should also mention that since our 1986 Westfalia is a Weekender edition (no stove or refrigerator), we have more interior room and slightly larger sleeping quarters than those vans that do have these features. With the pop-up top, the Westfalia is pretty comfortable to sleep in. You can put 2 smaller kids in the pop up area (or 1 adult) and 2 people on the lower bed. If you use the pop-up screen, open the windows and attach the backdoor screen, you’ll also find you can create a nice cross breeze. Well, it’s unfair to say a car from the mid 1980s handles well compared to modern cars, but our 1986 VW Campervan handles pretty well since it has new power steering, heavy duty shocks and is lifted a few inches. All things considered, it’s a pretty comfortable drive. Camping in a pinch if you didn’t make your campsite reservation or if your hoped-for first-come-first serve site is already booked. As long as you have permission from a land or store owner, you can essentially camp just about anywhere. If you’ve downloaded Van Alert (highly recommended), you can also scan for VW owner driveways or other places to pull over for the night. When we drive from Montana to Maine recently, we used Allstays Camp & RV app. It was invaluable when we found ourselves in a city or some other unfamiliar location late at night. You should check out the “Ron in a VW Vanagon” blog for some great #vanlife stories that include places Ron parked his Vanagon along the way. We’ve also found it easy to pull over at Walmarts, BLM land, gas stations or wherever else is convenient to sleep. There are a number of strategies for making memories, but driving around New England in a vintage VW campervan is definitely one of them. Sure, you would ultimately be more comfortable in a 25 foot-long RV, but will you be creating memories in your land yacht? Renting a VW bus or campervan in New England will definitely elevate your memory making quotient. Perhaps this is a reflection of age, but it’s hard to beat the ease with which you can pull over somewhere, pop the top and take a nap in the back or top. You might think of it as the ultimate mobile napping space. Check out a Jalopnik review of the VW Vanagon for an entertaining take on what it’s like to drive a Vanagon. Where Can I Rent a VW Campervan in Maine, Vermont or New Hampshire? At this point, we’re familiar with four different companies that rent VW buses, campervans or Westfalias in New England. Firefly Vans (our company) is the newest group in the mix. We currently have two vehicles: a 1973 VW bus and a 1986 Westfalia campervan. If we see enough demand, we’ll add another vehicle or two in the future. In the meantime, our focus is to go above and beyond with the quality of our vehicles and our customer service. Being the most recent entrant in the market—but not the smallest—allows us to think about how we can differentiate ourselves and win your business. One way we do that is by allowing rental periods less than one week during the summer and by flexing on your start and end dates. Most (or all) of the other VW rental companies typically enforce a one-week minimum on your reservation. In terms of additional differentiation, we also rent our show-quality 1973 VW bus out for weddings and special occasions. In terms of servicing our vehicles, we have Foreign Auto & Supply in Harpswell, Maine perform most of our important work. For tune-ups and regular maintenance, we have trusted local mechanics who have experience working on older VW campervans perform our regular maintenance work. As mentioned on our website, we spared no expense to upgrade our vehicles with new rebuilt engines, transmissions and other parts. The oldest VW campervan rental business in Maine is Maine Campers in Eliot, Maine. If you Google “Campervan rental Maine” or some combination of those terms, this company will come up first after the Google ads. 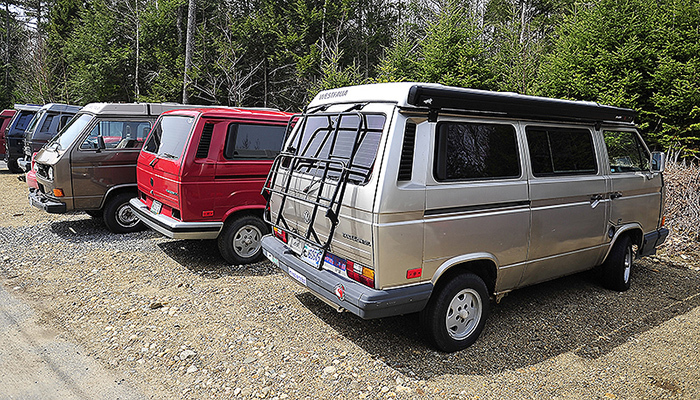 Maine Campers offers a bigger fleet of 1985-1991 Volkswagen Vanagon vans. It appears that most (or all) of their vehicles are gold and have the factory-provided interior. In comparing with other VW camper van rental businesses, it also appears their rates are the lowest although their daily mileage rate is lower than other companies in the area its unclear how they issue insurance since most VW camper van providers use the Outdoorsy booking platform to insure their rented vehicles—since there are so few insurance companies who provide this type of coverage. Although information about vehicle service isn’t on their website, we’re assuming most or all of their service work is done by Thompson Imports in Eliot, ME, since one will often see some of their vehicles parked there. Vintage Van Adventure is also a relatively new entrant in the Maine VW campervan rental business. Like others, they limit their driving distance and offer competitive prices. Since they partner with Foreign Auto & Supply, they’ve been able to grow their fleet quickly and have a wide range of different VW Westfalias available for rent. You have to get yourself up to Freeport or Brunswich Maine first—before you begin your trip. Vintage Can Adventures also uses Outdoorsy as their booking system, but it appears they partner with a different company to issue insurance and ask the renter to provide their own coverage over 18k. As Firefly Vans grows, we’d definitely like to find ways to partner more with Vintage Van Adventure since we both rely on Foreign Auto & Supply for our repair work and we admire their focus on customer service. If you check out their website, you’ll also see some restorations or vintage VW Vanagons or Buses for sale out of Foreign Auto & Supply. Back to the Vanagon rents out a 1985 Westfalia in Portland, Maine. They typically have a beautiful website that details some of their trips and offers more information about their vehicle, but as I was writing this article, I could not access their website. You can however still book their VW campervan on Outdoorsy, and like Firefly Vans or Vintage Adventure Vans, Outdoorsy will provide insurance and help you arrive at a final quote for your vehicle. When their website is back up, check out their well-written page about VW campervan-related Apps. Other RV or VW Campervan Rentals in New England? I’m surprised there aren’t any listed yet in New Hampshire or Vermont, but I’m guessing Maine may be the most logical place for most renters to start their trip since the Boston airport is only one-hour south and you should avoid driving in Massachusetts at all cost—simply too many cars, poorly maintained freeways and crazy drivers. Since there is always a chance your vintage vehicle will break down—regardless of who rents it or who well it has been maintained—you should also avoid large urban areas or busy roads. Thankfully, you won’t find many rentals in Massachusetts. If renting a VW Vanagon or Bus isn’t your thing, you might also want to check out renting a large minivan (bring your own camping gear) or a converted Mercedes Sprinter Van. The former is pretty tough to do if you’re not bringing all of your camping gear with you, the latter is a great option if you could care less about some of the VW campervan advantages I’ve listed above. If you’re looking at renting an campervan in some other state, you should check out the national campervan directory. While it depends on what kind of VW camper van or bus you’re driving, I thought it would be helpful to share some basic tips. First, get it out of your head that you’re driving a modern vehicle. Even if you’re driving one of our full restored camper vans, there is only so much we can do to modernize the vehicles. And even after re-sealing doors, windows and redoing the exterior, these older VW camper vans were never known for being quiet drivers. So, what should you be prepared for? The braking is OK, but not like your daily driver. Because of this—and because these are manual transmissions—you’ll need to rely more on engine compression and downshifting to slow down the vehicle. Visibility is OK, but not like most daily drivers. By that, I mean these vehicles were inherently designed to transport people and adapt for different camping or outdoor applications. Consequently, many camper vans—like ours—have curtains. Although they’re pulled out of the way while driving, there are still curtains. And, unless you’re in a 21-window Samba, it would be a stretch to say the windows were designed to enhance visibility. Gas mileage is poor. If you’re lucky, these four-cylinder engines will get you almost 20 miles to the gallon. If you’re driving over a lot of hills with frequent stops and starts, you may be down at 15-miles to the gallon. In terms of tips, my first is to ensure you’re comfortable driving manual or standard. If you’re not, these are not the cars to use for learning. Also, don’t worry about situations where you may be driving slower than the cars around you. The last thing you want to do is to over commit your speed on a steep hill and struggle with slowing down. Although most of New England is relatively flat, there are sections of Vermont with very steeply graded hills. When you see a sign warning you of an upcoming steeply graded hill, crest the hill slowly (45-50 miles per hour) and be ready to brake and downshift into third if you feel like you’re picking up speed too quickly. Keep kind mind that the goal in situations like this is too avoid going so fast that you’ll have a hard time slowing down. 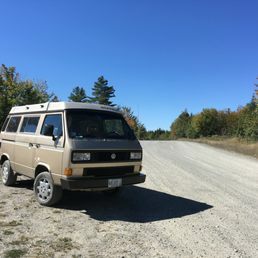 While our ’86 Vanagon handles the Continental Divide pass with no problems, some of the very short but steeply-graded hills in Vermont require quicker reaction time and a willingness to start your downhill driving more slowly. Why would I share helpful information about my competitors? Ultimately, we started our business to make our customers happy and to offer access to a unique, memorable type of adventure in New England. While we could have purchases some new(er) van conversions at a lower cost, we wanted to focus on making memories. After driving our vintage VW camper vans around, we realized they provided access to people we would have never met, stories we would have never heard and memories that will last a life time. Like most things that seem to matter in life, our vehicles aren’t particularly practical or cheap. They don’t have air-conditioning (the systems that power these are inefficient and use outdated forms of AC). Also, when you reach maximum speed on a freeway, these older Vanagons can be downright drafty (even with new window/door seals, etc.). In light of this “memory making” focus, we want you to be fully equipped to make the best choices when you’re planning your vacation. 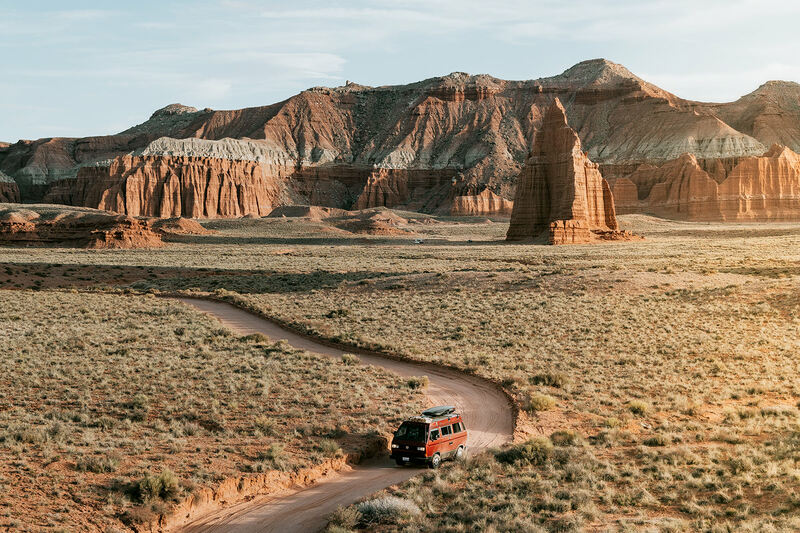 For most of us who aren’t on a full-time #vanlife journey, we only have 4-5 weeks of vacation and we’re ultimately looking to maximize that time with our friends and family. Even though we think our vehicles and customer service are top notch, there are other options you can explore. And, in case you’re entertaining a Mercedes Benz Sprinter, we recommend this one in New Hampshire.